This tiny sheltered south facing Islington garden was designed as a continuation of a recently built extension of the three storey Victorian town house. 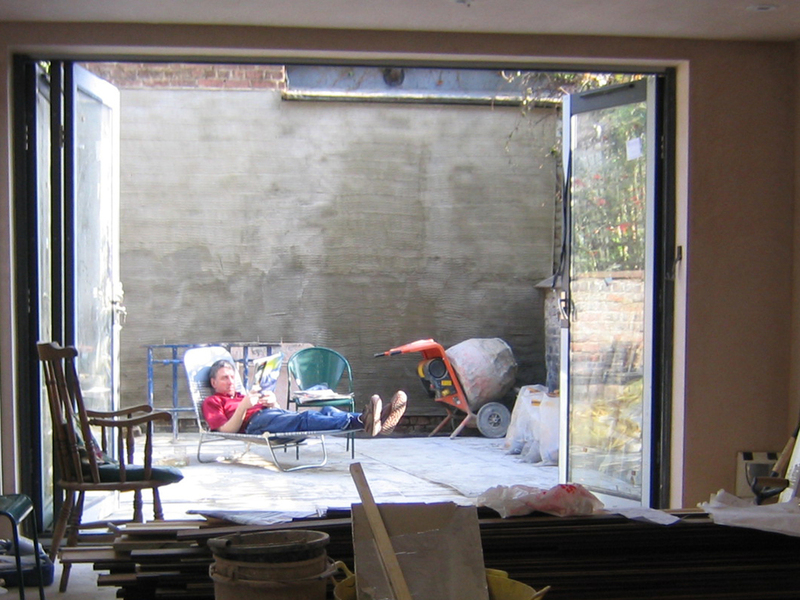 Sliding doors open onto the full patio width, built from reclaimed London bricks chosen to compliment the existing architecture. To the east side is a small storage unit housing garden tools, with a raised planter and water feature constructed with the same bricks. Graded horizontal Douglas fir fencing extends to the rendered painted back wall. The shadier boundaries are planted with a small leaved Ivy, large leaved Fatsia and shuttlecock ferns, with Helxine creeping into crevices. The west facing raised planter benefits from shelter and sun and is planted with Mediterranean herbs in free draining soil. A twining Wisteria and annual planter provides a summer floral display.